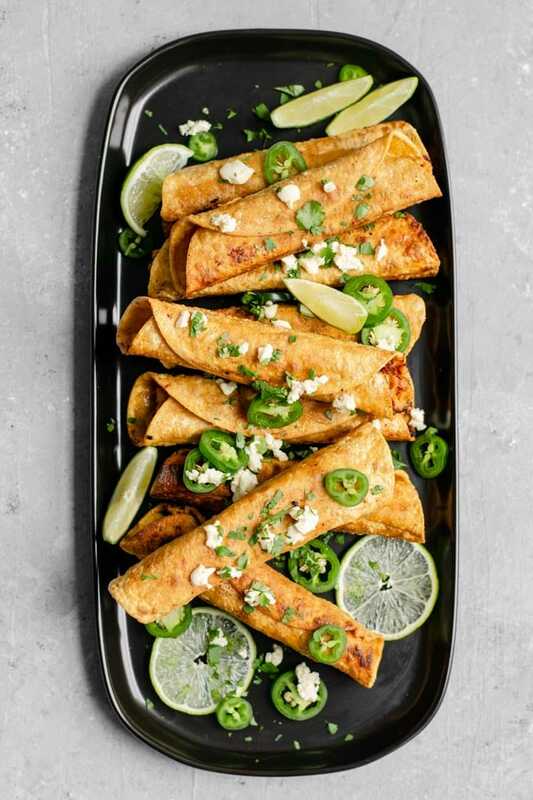 These crispy taquitos, also known as rolled tacos, are stuffed with a vegan cheesy beefy filling. They are super easy to make and are delicious as a snack or for dinner. 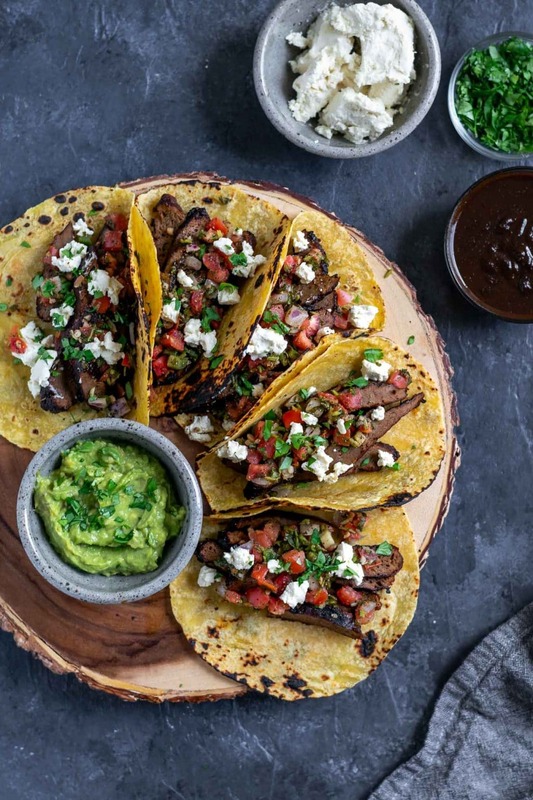 Enjoy with salsa, guacamole, sour cream, or vegan queso! Papas con rajas tacos get me every time. I mean, how does something so simple contain so much flavor?! Papas translates as potatoes, and rajas refers to the strips of roasted poblano peppers which are sautéed with onion. Together they are the most satisfying pair…. 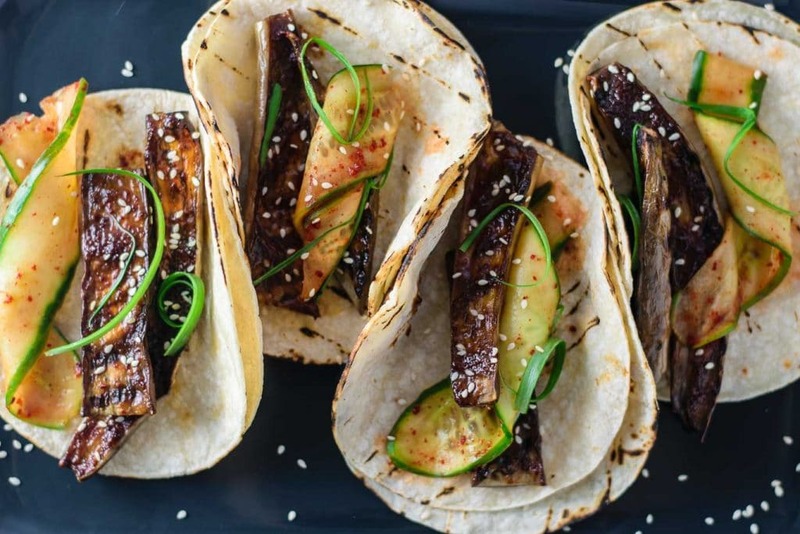 If you’ve never had the Japanese dish nasu dengaku (miso-glazed eggplant), you’re in for a treat! The first time I ate it I had to wonder what sorcery happened to the eggplant. How is something so simple SO good? It’s like, just eggplant, with a miso glaze broiled on top of it. The eggplant becomes so tender, without succumbing to mushiness, and that miso-glaze is a savory flavor bomb. 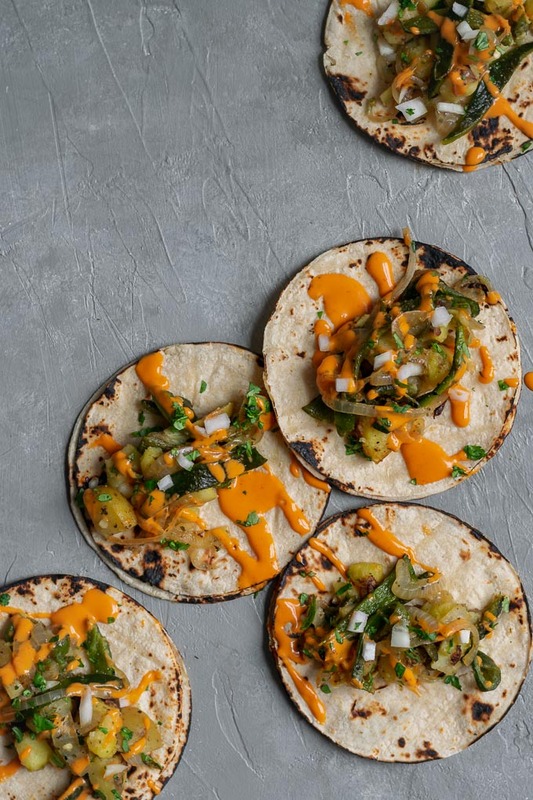 Here it’s paired with crisp and chili-flecked marinated cucumbers for a juicy, spicy bite, and stuffed into corn tortillas for easy handheld eating…. Have you guys ever had tinga? It’s a traditional Mexican dish where shredded chicken (which is easily substituted to make it vegan) is cooked in a tomato, onion, and chipotle in adobo sauce. The simple sauce is made of only TEN ingredients and packs a ton of flavor. It’s tangy and smokey, tomatoey and oniony, and oh so mouth-watering delicious. 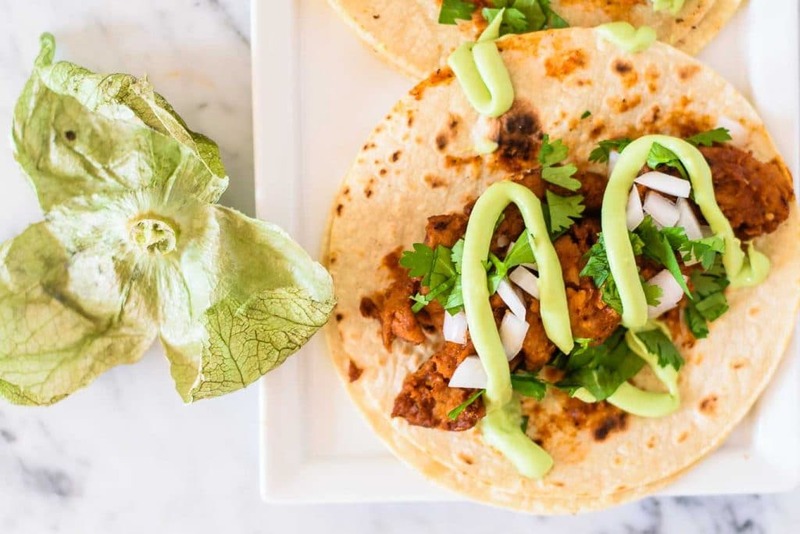 It quickly became a favorite around here, to the point where we made 4 batches in one week–in part because the first day I made it Omar ran out to the store for more tortillas (not that we were out yet) and brought home a 5-pound bag of them. Did you know they sold tortillas in 5 lb bags? Me either. For those of you concerned about our current tortilla status, we had some friends over for a tinga taco party (I highly recommend you do the same) and that took care of most of them….